We are going to Sinsinawa… yes! In 1835, a 29-year-old Father Samuel was sent to the “most western” part of the United States to erect churches and minister to miners, settlers and native Americans. He worked in the tri-state area (Wisconsin-Illinois-Iowa) until his death in 1864. A thorough examination of Father Samuel’s life and writings has led the Holy See to declare him a “Venerable” Servant of God. Venerable Samuel is now a candidate for beatification and canonization (awaiting the authentication of miracles obtained through his intercession). We will celebrate Mass in St. Patrick Church at Benton, a stone church built by Father Samuel, and visit his grave in the parish cemetery there. We will visit a museum containing many items owned and used by Fr. Samuel (second-class relics) at the motherhouse of the Sinsinawa Dominican Sisters, a community founded by Fr. Samuel. And finally, we will tour St. Augustine Church at New Diggings — a frame church built by Fr. Samuel that is still in its 18th century condition — where our guide will be a descendant of pioneer parishioners served by Fr. Samuel. Our pilgrimage will offer a rich experience of the life of Father Samuel and insights into the early history of the State of Wisconsin. Join us for this very special opportunity. The coach bus will pick up pilgrims at 7:00 am at Holy Redeemer and 7:15 am at St. Patrick. We will return to Madison around 6:00 pm. You know why I’m excited to be going to, yes, Sinsinawa? It is going to be as beautiful as the other parish pilgrimages have been and the Cathedral Parish pilgrims are going to learn about the holy life and example of and pray for the intercession of Venerable Father Samuel Mazzuchelli. The following had no connection with the parish pilgrimage. But I mention it anyway. Monsignor Holmes told a story in his homily at 11am Mass yesterday, about Franciscan University of Steubenville, Ohio. It was like a lot of other insignificant little Catholic colleges that had been originally founded to teach the members of a religious order, and had then been opened to the public to spread the good that a Catholic education offers. But in the 60s, it really declined, like so many of its kind, was financially ailing and no longer attracting talented students, and the distinctive thing about it was that students had a lot of time for socializing, “the kind of socializing that went on last night on Mifflin Street“. In 1974 the Third Order Regular Franciscans assigned a new one of their members as president of Franciscan U, Fr Michael Scanlan. Fr Scanlan could have reflected that his talents and charisma would enable him to set and achieve goals to make the university more successful, for instance increasing enrollment 10%, increasing the endowment 10%. And he perhaps could have accomplished that, but, said Monsignor Holmes, “it would not have made a bit of difference.” Because it would not have done anything at all to increase the spread of the Gospel. What Fr Scanlan in fact did was make an appointment with the Lord for several hours per day, and he prayed. He also worked to “make Jesus Christ the Lord of the campus in every aspect.” And God did for Franciscan University what human effort and talent all by themselves, could never have done. Let us pray to holy and Venerable Father Mazzuchelli. 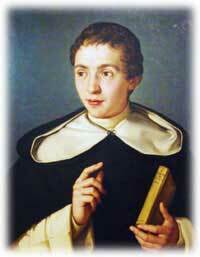 A miracle attributable to his intercession can help advance his cause for canonization. Consider coming on the pilgrimage and seeing some sites associated with his holy life and getting to know about him. 2 Responses to We are going to Sinsinawa… yes! You can be with us in spirit! It made me happy to see you during Holy Week. At the big St Paul’s fundraiser “Spring Wine Fest” the special speaker was the vocations directress of the very orthodox and habit wearing Dominican Sisters of Mary Mother of the Eucharist, who have had an incredible vocations boom, growing to over 100 Sisters within 24 years or something like that, and the average age is 28. Wow! The Sinsinawa Dominicans, ouch, very different. But Ven. Fr. Mazzuchelli will pray.